Varicose veins are the large, “rope-like” veins which are often one-quarter inch or larger in diameter. Some people have no symptoms with varicose veins. Some people may have a pulsating pain, a feeling of heaviness or fatigue, and/or a burning sensation over the dilated vein. This discomfort usually occurs after long periods of standing or after having the legs down without exercise. This discomfort is usually worse at the end of the day and will disappear or improve after elevating the legs above the level of the heart. 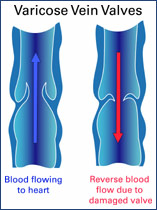 Varicose veins involve the superficial venous system as opposed to the deep system. Varicose veins are the most frequent kind of chronic venous insufficiency and are present in about 15-20% of adults. A main vein of the superficial system is the saphenous, located along the inner part of the leg. The walls and valves of veins are thin and elastic, and can stretch due to a variety of situations including pregnancy, heredity and age. When varicose veins become severe, they can produce a syndrome referred to as chronic venous insufficiency. Symptoms of chronic venous insufficiency include aching pain, easy leg fatigue and leg heaviness, all of which worsen as the day progresses. Left untreated, chronic venous insufficiency can cause ulcerations which can be very difficult to treat. Approximately half of the population has some form of venous disease, and varicose veins affect about one out of two people age 50 and older, and 15-20% of all adults. 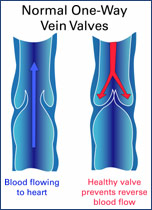 Varicose veins are treated by stocking support, intermittent leg elevation, and good exercise. If the veins cause symptoms over their surface, then they can be removed, or ablated. Indications for removal or ablation include pain over the veins, bleeding, or thrombophlebitis.